Arkansas's finest got together in the meeting quarters of an organic grocery store, but didn't let the delicious eats throw them off task. They rolled up their sleeves and got to work planning a months worth of activities for their climate team. The crew talked about their past involvement and future interests in the movement, sharing anecdotes and experiences from working with other environmental groups and drumming up a host of ideas for future actions. Right now they're putting together an activism contest leading up to COP-17 in Durban, as well as a number of sustainability info sessions. These forward thinkers have an appetite for climate justice and aren't shy about scraping the plate. 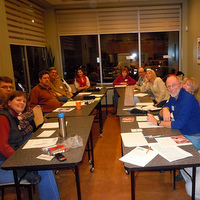 Locals met at the Flying Star coffee shop for their first team meeting. Discussion quickly came to the vast battle field for social justice issues, but the group wholeheartedly agreed that climate is the fight that needs to be won first. "If we lose climate, the rest are moot," explained Regional Coordinator Akilah Sanders-Reed. The crowd was a great mix of religious leaders, Native Americans, artists and youth representatives. Most attendees were new to the climate movement, but budding with ideas -- particularly with events networking into the Native American community. Our friends in Michigan got together for a home style potluck. Hungry for some food for thought? Regional Coordinator, Acacia Williams gives us the breakdown. We talked about a lot of things, including the topic that naturally arose from a potluck: food issues. Most of our folks are addicted to volunteering and have many causes they care about and we had some lively discussion about food choices and their impact on greenhouse gasses. When we settled down to business, the conversation took off on what they saw as the issues in Michigan related to climate change; what we needed to do as a group to grow the movement locally; and the strong desire to do a community service type action which would be related to climate change - like weatherizing a house or working on a community garden." The team looks forward to putting together activities with the perfect mix of business and fun as they go out to defend the Clean Air Act and educate the community on environmental health. This intense three-hour meeting generated lots of ideas and even more enthusiasm for getting events in motion. Activists from Minneapolis and St. Paul gathered together ready for action. The crew ran the gamut: students, teachers, religious leaders and families were all in attendance. Three different congregations were represented at the meeting, excited about taking a stand and getting members involved in climate activism locally. One leader even spoke about starting a climate action team within his church. New friends and old gathered to talk about what brought them into the movement: an interest in climate policy, concerns about hydraulic fracturing (or fracking), advocacy for more comprehensive and clean transit systems -- just to name a few. Together they planned how to spread the good word about climate activism in their neighborhood. Their future includes visiting their members of Congress, hosting climate change movie viewings and reaching out to other groups with the same ideals. All these events are just a taste of the good vibrations coming from around the states. Looking for more? You can get a full look at what our friends in Colorado are up to by reading Micah Parkin's blog post about her house party. Couldn't make it out to a house party? You can find more information about other happenings around your area on our Get Local events page.